Hatha Yoga is an ancient practice. Yoga means “union” and the word Hatha derives from two roots: ha means “sun” and tha means “moon”. 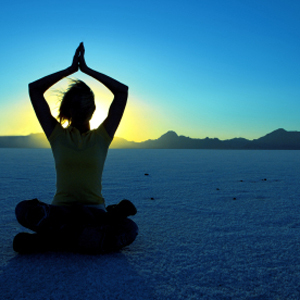 So Hatha Yoga means to unite the sun and moon energies in our bodies and create balance and harmony. Hatha Yoga includes asanas (postures), pranayama (breathing), cleansing and diet. All practices of Hatha Yoga promote purification. They all remove impurities from the body and cleanse the bloodstream. The primary purpose of the asanas is the reconditioning of the system, body and mind, to effect the highest possible standard of muscular tone, mental health and organic vigour. All asanas are intended directly or indirectly to quieten the mind. The postures are adopted and held. They are done purposely slowly and without straining to achieve a pose someone beside you is doing. Yoga is non-competitive.Pranayama increases vital capacity and energizes the lungs while it exercises the respiratory muscles, oxygenates and purifies the bloodstream, removes phlegm and leads to healthful breathing habits. Yoga is the art and science of self-discovery. Although strictly speaking Yoga is Indian and Hindu – it is not a religion but rather a natural way of life that works toward balancing the negative and positive forces, achieving harmony or perfect health. Ultimately, Yoga is an attitude toward life. And, the goal and means of attaining it are the same: to learn through our own experience to become a whole, balanced, creative person, and to live a life of peace, love, and harmony with the world around us. “Relaxation begins immediately when you enter Monica’s yoga workout area. The surroundings are comfortable and Monica is always happy and bubbly and makes me feel this is my time for relaxation and there is no competition as I have experienced at previous Yoga groups. The feeling is exceptional as this is a one on one Yoga class and it is my time to relax and enjoy. – Breathing techniques and warm-ups before starting exercise are a very important part of Monica’s program. Breathing properly, relaxing and feeling safe and secure is the greatest experience you can achieve before beginning with the stretches. Sylvia Orenchuk & Kathi Williams, Victoria, B.C. “I just want to thank you for your superior instruction … I had taken yoga before but not with such an enthusiastic and informative instructor as yourself. Your expertise, gentleness, wisdom and empowering classes, … have led me to sign up for more! … people who give 100% all the time are a rare find. Monica, you are a rare find and a true angel. Our class feels spoiled indeed. I feel blessed to have met you.”.